The Glenbarrow Eco walk is a novel walk that has been developed in association with local communities and its aim is to inform people about the environment while enjoying their walk. The Eco walk consists of 10 stops which are identified by sequential numbers. 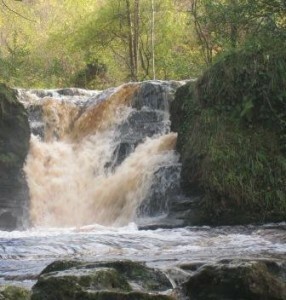 The Glenbarrow Eco walk starts in the car park and follows the same path as the other walks along the river. The walk heads up the valley at the last footbridge onto the ridge of Capard passing the Metal Man. The Ridge of Capard offers panoramic views of the surrounding landscape and is well worth a visit. As well as this the stops along the way are very informative on environmental and cultural/historic matters.